Did you know that one of the top universities in Indiana gives first-year students over $36 million in funding every year? Did you know you could be getting internship experience during college in return for financial aid? And that’s not all that Indiana has to offer to students who want to go to college. As a resident of Indiana, you have many options to help fund your education. Let’s go through these options step-by-step. Your first step in applying for financial aid begins with a form known as the FAFSA, which stands for the Free Application for Federal Student Aid. FAFSA is how the federal government distributes over $150 billion of government funding to students nationwide, so make sure you take advantage of this financial resource. However, even though FAFSA is an essential form to obtain tuition aid, many people find it difficult to complete it because it’s confusing and lengthy. That’s why we’ve come up with a step-by-step guide to completing the FAFSA questions to help you get through the form as easily as possible. While the FAFSA can be an incredible resource, you should also look into state resources that may apply to you. For example, you should look at the website of the Indiana Commission for Higher Education,which distributes scholarships and grants. And remember, you don’t need to pay back scholarships and grants so you should make sure that you apply to any and that you are eligible for! Let’s take a look at some of the scholarships available to Indiana residents. 21st Century Scholarship gives students up to four years of need-based financial assistance. Mitch Daniels Early Graduation Scholarship provides one-time funding for students who graduate from public high schools at least one year early. Next Generation Hoosier Educators Scholarship is a program that gives financial aid to students who agree to teach five years at eligible Indiana K-12 schools. William A. Crawford Minority Teacher Scholarship gives financial assistance to minority students to teach in an Indiana school for three years after graduation. Other state scholarships include scholarships for spouses and children of military and public safety officers (scroll down to view these scholarships once you click on the link). There are also many grants that are offered to Indiana residents. Frank O’Bannon Grant is Indiana’s main need-based tuition aid program. EARN Indiana (Employment Aid Readiness Network) is a work-study program that gives students career experience, as well as financial help, through paid internships. Student Teaching Stipend for High-Needs Fields grants financial aid to students who want to teach in a “high-needs” field, such as middle or high school level math, science, or special education. Earline S. Rogers Student Teaching Stipend for Minorities presents qualified, student minorities with a stipend for participating in student teaching or a school administration internship. While the state of Indiana has many financial opportunities to support your college education, there are even more opportunities to receive funding through institutional, local, and national scholarships. A great way to discover new scholarships and grants that you might be eligible to receive is by going to the financial aid websites of the colleges or universities that you are applying to. Take for example Purdue University’s scholarship webpage. Purdue has many scholarships broken down into five different categories: scholarships based on financial need, scholarships based on leadership and/or service, scholarships based on special interests, departmental scholarships, and private scholarships. Similarly, the University of Notre Dame gives financial assistance to 76% of undergraduate students, giving over $36 million of need-based aid to first-year students. Additionally, the university gives over $1.8 million in merit-based scholarships to first-year students. For example, the Besio Family Scholarship provides $25,000 per year of aid to students of the College of Engineering or of the College Business who demonstrate high academic achievement, personal character, and community service. You can also talk to your guidance counselor to check if any local scholarships and grants are available to you, such as any activity or leadership-based scholarships for students in your area. Remember, the more research you do the better, so make sure you look into all of these options! Finally, if you find that you need additional financial assistance to cover tuition costs, you should consider taking out a student loan. Finding the right lender with the right rate can be challenging—but is obviously extremely important. 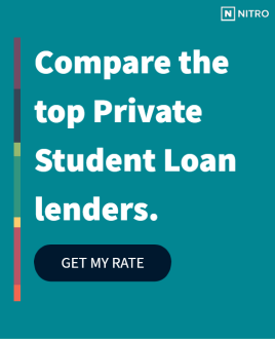 That’s why we’ve compiled a list of the best banks for private student loans. You can also use our free NitroScore tool to help get a better idea of what your financial situation will be after college based on your school, major, financial aid, and savings. Nitroscore can help you make smart loan decisions based on loan repayment forecasts and your projected income. Using NitroScore and our step-by-step guide, you will be able to apply to college as a more informed applicant and be ready to take on your future!